How did Japan fall from challenger to US hegemonic leadership in the high tech industries in the 1980s, to stumbling giant by the turn of the century? What is it doing about it? 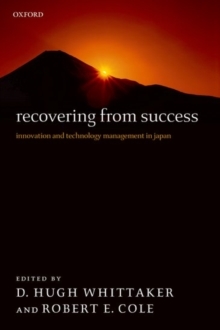 This book examines the challenges faced by Japan's high tech companies through successful emulation of some of their key practices by foreign competitors and the emergence of new competitive models linked to open innovation and modular production. High tech companies were slow to respond, relying at first on formulae which had worked in the past, but in a new environment, some of these traditional strengths had now become sources of weakness. Stability and success, moreover, had decreased their appetite for risk. Early in the new century, however, there were signs of a more concerted response, which opened up past practices to scrutiny, and modification through selective learning and adaptation of the new models. The 'MOT' (managementof technology) movement provided a vehicle for this change. It was linked, in turn, to efforts to change the national innovation system, giving universities a more central role, and encouraging spin-offs and startups. The book features contributions from Japanese and Western scholars and practitioners who have distinctive insights into the nature of these challenges and responses, with substantial introductory and concluding chapters. The result is a highly accessible account of innovation, technology, and change management in the world's second largest economy.